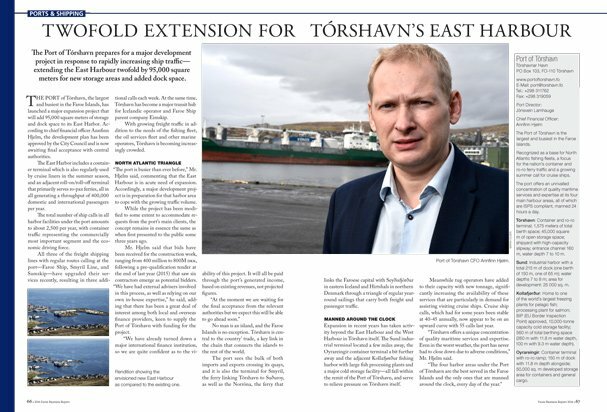 The Port of Tórshavn prepares for a major development project in response to rapidly increasing ship traffic — extending the East Harbour twofold by 95,000 square meters for new storage areas and added dock space. The Port of Tórshavn, the largest and busiest in the Faroe Islands, has launched a major expansion project that will add 95,000 square meters of storage and dock space to its East Harbor. According to chief financial officer Annfinn Hjelm, the development plan has been approved by the City Council and is now awaiting final acceptance with central authorities. The East Harbor includes a container terminal which is also regularly used by cruise liners in the summer season, and an adjacent roll-on/roll-off terminal that primarily serves ro-pax ferries, all in all generating a throughput of 400,000 domestic and international passengers per year. The total number of ship calls in all harbor facilities under the port amounts to about 2,500 per year, with container traffic representing the commercially most important segment and the economic driving force. All three of the freight shipping lines with regular routes calling at the port—Faroe Ship, Smyril Line, and Samskip—have upgraded their services recently, resulting in three additional calls each week. At the same time, Tórshavn has become a major transit hub for Icelandic operator and Faroe Ship parent company Eimskip. 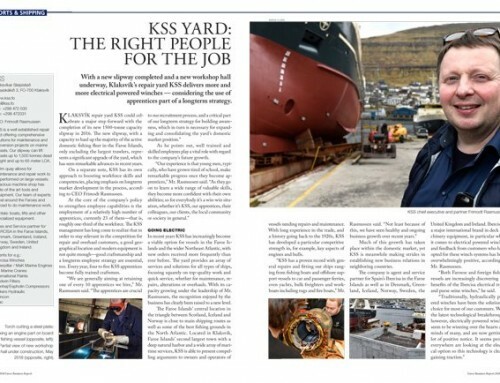 With growing freight traffic in addition to the needs of the fishing fleet, the oil services fleet and other marine operators, Tórshavn is becoming increasingly crowded. 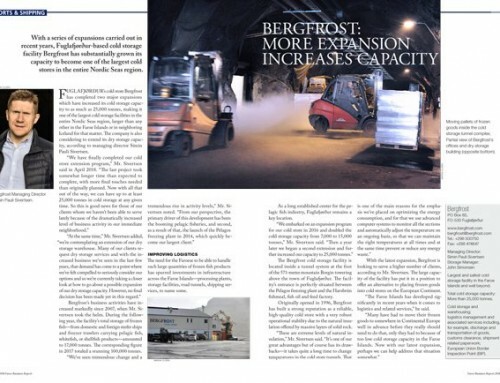 “The port is busier than ever before,” Mr. Hjelm said, commenting that the East Harbour is in acute need of expansion. Accordingly, a major development project is in preparation for that harbor area to cope with the growing traffic volume. While the project has been modified to some extent to accommodate requests from the port’s main clients, the concept remains in essence the same as when first presented to the public some three years ago. Mr. Hjelm said that bids have been received for the construction work, ranging from 400 million to 800M dkk, following a pre-qualification tender at the end of last year (2015) that saw six contractors emerge as potential bidders. 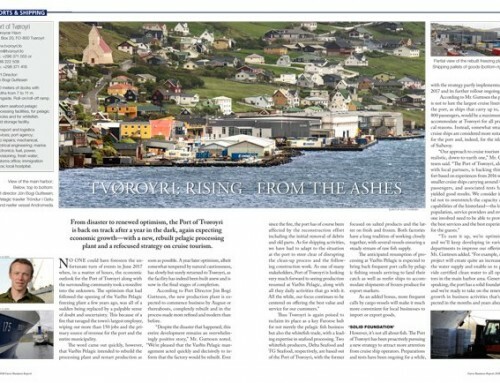 “We have had external advisers involved in this process, as well as relying on our own in-house expertise,” he said, adding that there has been a great deal of interest among both local and overseas finance providers, keen to supply the Port of Tórshavn with funding for the project. “We have already turned down a major international finance institution, so we are quite confident as to the viability of this project. It will all be paid through the port’s generated income, based on existing revenues, not projected figures. No man is an island, and the Faroe Islands is no exception. Tórshavn is central to the country’ trade, a key link in the chain that connects the islands to the rest of the world. 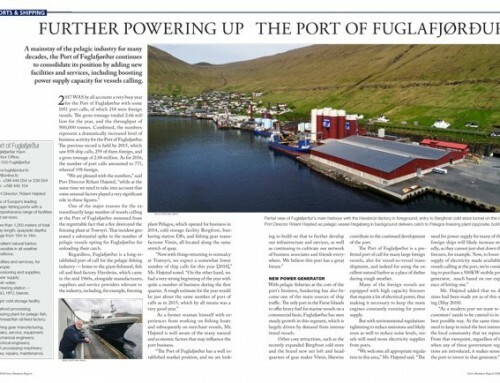 The port sees the bulk of both imports and exports crossing its quays, and it is also the terminal for Smyril, the ferry linking Tórshavn to Suðuroy, as well as the Norröna, the ferry that links the Faroese capital with Seyðisfjörður in eastern Iceland and Hirtshals in northern Denmark through a triangle of regular year-round sailings that carry both freight and passenger traffic. Expansion in recent years has taken activity beyond the East Harbour and the West Harbour in Tórshavn itself. The Sund industrial terminal located a few miles away, the Oyrareingir container terminal a bit further away and the adjacent Kollafjørður fishing harbor with large fish processing plants and a major cold storage facility—all fall within the remit of the Port of Tórshavn, and serve to relieve pressure on Tórshavn itself. Meanwhile tug operators have added to their capacity with new tonnage, significantly increasing the availability of these services that are particularly in demand for assisting visiting cruise ships. Cruise ship calls, which had for some years been stable at 40-45 annually, now appear to be on an upward curve with 55 calls last year. 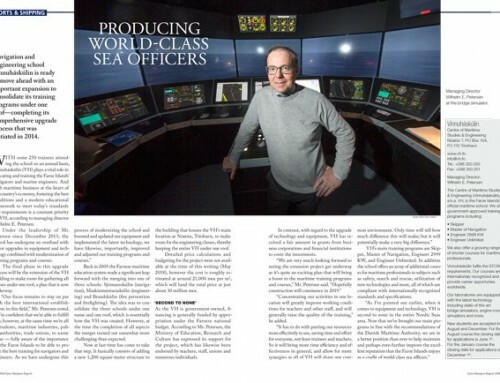 “Tórshavn offers a unique concentration of quality maritime services and expertise. Even in the worst weather, the port has never had to close down due to adverse conditions,” Mr. Hjelm said.